Please login using username and password, you received directly from breast Centres Certification Operating Office. Welcome in the Breast Centres Certification website. 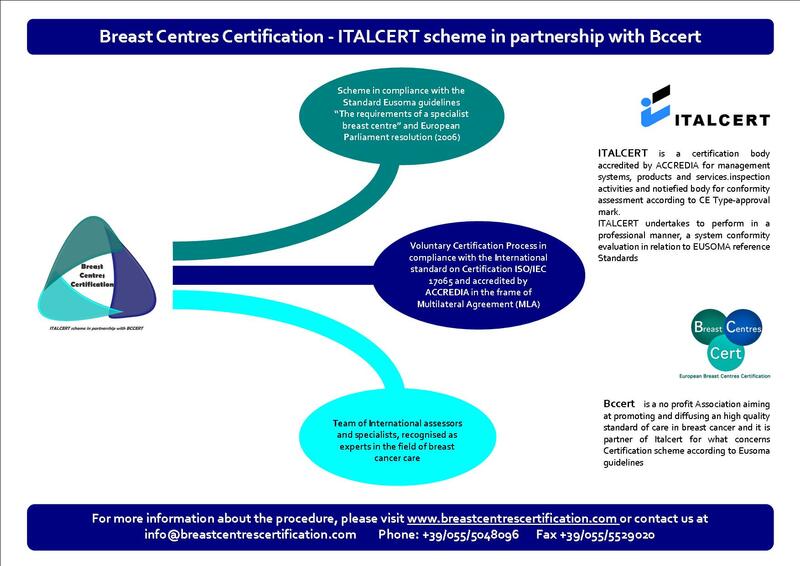 Breast Centres Certification procedure is a collaboration between ITALCERT Srl, a certification body in the field of management system, product and services, and BCCERT, a no profit society aiming at promoting and diffusing an high quality standard of care in breast cancer. BCCERT takes care of the procedure, from an operative, organizational and scientific point of view. Eusoma guidelines "The requirments of a specialist Breast Centre"
ITALCERT srl - all rights reserved. Registered office: Viale Sarca 336, 20126 Milan (ITALY). REA Number in Milan 1387323- VAT identification number 10598330156 - Share capital € 88.870 i.v.